Whether you are trying to lose a few pounds or you just really love country music, put your dancing shoes on, grab your Wii remote and start movin’ to the music! 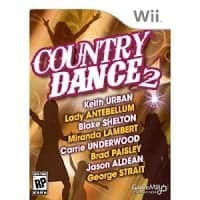 Country Dance 2 for Wii has over 18 CMA award winning artists and 30+ songs for you to enjoy. Did you know that thirty minutes of line dancing burns about 150 calories?? So, my opinion: I liked the selection of music, although none of the songs is what I would call the artist’s biggest hits. I found the moves fairly hard to follow if I tried going by the little diagrams that scroll along the bottom but easier to get if I just mimicked what the on screen dancer was doing. This will require some repetition to really get, though. Once I figured out the moves, scoring the points was fairly easy. Both of my kids (10 and 12) thought it was too hard but it isn’t really designed for kids. Overall, it was good music and fun to try and figure out. With practice it will be a fun way to get your heart rate up but keep the blinds closed while you learn so the neighbors don’t fall out of their chairs laughing! You can buy this in store or online at Target or Walmart or at the link below on Amazon. Disclaimer: I received one game mentioned here in exchange for my honest review. All opinions expressed here are mine and mine alone. I love DDR so I really want to try this next generation of dancing games!